“Last night I was too outspoken about Calvin’s predestination. Maybe I had the excesses in mind – e.g. the slave trade, the precipitation of revolts in the Dutch colonies, and the pursuit of capital – and I had too little attention to its merits, such as keeping livable a large piece of land below sea level and a large tolerance often based on a good business attitude. I am often too outspoken, more mildness would suit me”, says Carla. “I admire Holland for its pictorial art, its pragmatism, its relatively good housing for everyone. This too is the result of the business attitude and God’s stewardship that has also taken shape in a socialist manner in last century. You have aptly expressed a number of starting points for derailments that were partly caused by Calvin’s doctrine of predestination. Any movement or sect that considers itself superior, has a strong tendency for derailment over time. There is Narrator”, says Man. “That’s right, the capitalists pursuit maximization of profit , and hereby they are biting their own tails similar to players of a pyramid scheme. The sources of capital are enormous, but finite: once they will dry up. Probably the meaning of capitalism is derived from the Roman word “caput” , which means head (of a person). This origin underlines the importance of private property within capitalism. Capitalism got a new dimension in nomadic societies of herdsmen; the capital of these nomadic herdsmen were their flocks and their pastures. The corresponding capital resources – such as animals for transport and for herding cattle – were used for tending and defending the herds of cattle, or men needed these devices – such as women and children – for survival. A religious expression within these societies of herdsmen was the cattle cycle . In the Proto-Indo-European world, women represented the only possession of real value ; men needed the possession of livestock as a means of exchange to obtain women. In the Roman Catholic and Lutheran version of the Ten Commandments, we still see a relic hereof in the form of the ninth commandment: “Thou shalt not covet your neighbour’s wife” prior to the tenth commandment: “Thou shalt not covet your neighbour’s house” . Within the societies of herdsmen and farmers, bartering was needed, because people within these societies were not completely independent in their existence and because the need for specialized tools or services increased over time. There was barter needed at local markets or during fairs. The barter proceeded initially in kind; later rare objects – first rare stones or metals, and later coins with an image of a leader as trustworthy “person in the middle” – were used as “objects in the middle”. During and after the Crusades in Western society in the second half of the Middle Ages, the trade in special items and services took further shape. Hereby, and also by the decay of feudalism arose a new economic organization during the Renaissance in Western Europe, where trade supported by the (city-)state in the form of mercantilism  increased further in importance. With mercantilism, the importance of coins as a trustworthy “object in the middle” also increased. Possession of coins became more and more an independent worthwhile life purpose in itself, because with money, all life goals could be obtained even remission of sins for a good afterlife through indulgences  within the Catholic Church. By mercantilism, the attention within the lives of people moved more and more from “to be” to “to have”. In the earlier world of scholasticism, one was a human in a predefined order of life in which one ought to live virtuously. In the new world order, ownership of money became a great good in itself whereby a good place in life and in the hereafter could be obtained; owning and maintaining money rose in esteem, and gaining profits changed in the course of time from despicable act in a praiseworthy activity. 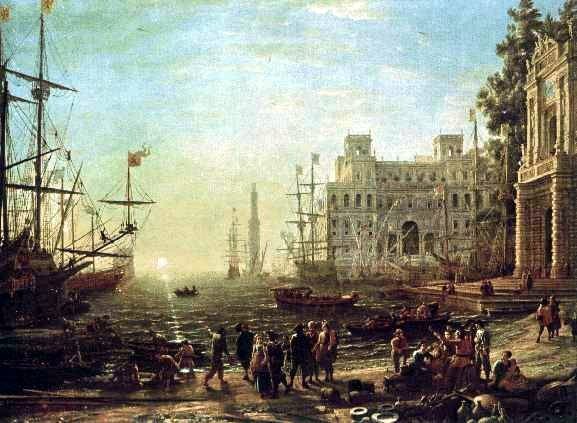 For the “common people” of farmers, local traders and craftsmen in Holland , this new form of mercantilism meant a landslide; their whole economic existence could completely disappear in a short time by a cause from outside; others – often in modified form – may easily take over their livelihoods. They could not influence this change in any way. Within this change of the environment of the “common people” – from a world modelled after the medieval scholasticism to a new world of mercantilism – Calvinism arose during the Reformation in relatively prosperous Geneva , and it found a fertile ground in the Netherlands of the 17th century AC. By Calvinism in connection with mercantilism, the main focus of people’s lives changed from “to be” to “to have”. While in Calvinism – with its the doctrine of predestination – “being” in God’s grace was of supreme importance. But on one hand the gratitude and obligation for the elect to be God’s steward and on the other hand the constant desire for success as forecast for the election by God, meant that “to have” in earthly life is of immanent and immeasurable importance for “to be” in this life and especially in the afterlife. “We live in a society that is based on the three pillars of private property, profit and power. Acquiring, possessing and making profit is a sacred and inalienable right – and a duty as God’s steward according to Calvin’s predestination – of an individual human being in the new world order that has emerged from the mercantilism. Thereby it does not matter where the property comes from, nor whether there might be obligations attached to one’s property” . In our modern times, paper money is exchanged for virtual bits in computer systems that offer – via monitors – access to terrestrial resources. These virtual bits had started an environment of its own, wherein mankind will be more and more a servant – or slave – to the many forms of bitcoins in these computer systems. Having access to this world of bits and monitors overshadows “being” in our daily life. Through a long detour, the emptiness of the virtual bits and monitors have confiscated the richness of our existence. This is in a nutshell my introduction to capitalism”, says Carla. “To have or to be. After this truly somber picture of human existence. I would like to show you a different kind of emptiness: the emptiness of the Waddenzee. The next few days the weather will be good. May I invite you for the last sailing trip with my small sailboat; soon I will give the boat to a good friend who is much younger. On the sailboat we may prepare “emptiness” – the next part of our quest”, says Man. This entry was posted in Five, Five - Intensity and association and tagged agriculture Louis Beyens, Amsterdam, bitcoin, bonds, Calvin, capitalism, cattle breeding, Cattle cycle, coins, colonies, common people, device, Dorothee Sölle, ego, Erich Fromm, Francis of Assisi, Genève, God’s steward, Holland, hunter-gatherers, indulgences, John Ayto, John Stevens, kapitaal, Kevin McGrath, maximisation of profit, mercantile spirit, mercantilism, nouveau riche, object in the middle, person in the middle, predestination, Renaissance, Rӯokan, Scholasticism, securities, sins, slave trade, state, status, to have or to be on 2 August 2014 by Jan van Origo. “On the evening in March 1933 when I came into the life of my parents, they decided to leave Frankfurt am Main. They moved to Amsterdam with abandonment of many of their possessions. They have never told me, but I think I am conceived during that night within a cocoon of love, hope and consolation. First a sketch of the time and area wherein I came to life. After the defeat in “A war like no other, a war as everyone”, Germany fell into a deep economic crisis with high unemployment. 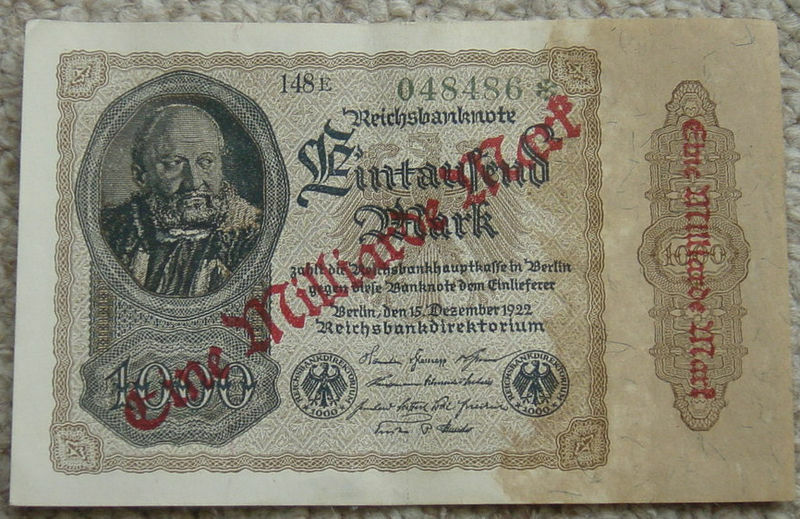 In 1923 due to the reparations, the hyperinflation of money – the confidence inspiring “object in the middle” – was so enormous that the salary earned at the end of the morning had to be converted in one bread, because in the course of the afternoon that money became worth only a few slices. 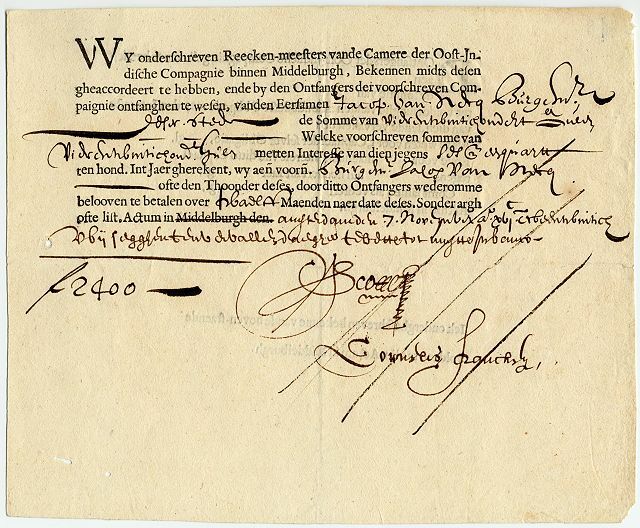 At that time my grandparents have based a small capital in sound currency in Switzerland and the Netherlands. My foreparents and parents have always been outliers in every society – also in Germany – with all consequences thereof. In the second half of the 1920s and the beginning of the 1930s Germany created an overwhelming dynamism, hope and wrath – icy wrath . Motorways were built, industry flourished, an huge urge to life came into existence and the soldier’s boots were prepared for a mars forward. “Everything on the puff; who is going to pay”, said the grandmother of Hermann Simon in Heimat – Eine deutsche Chronik  after visiting her family in the Ruhr area. The future price was still unimaginable . In order to establish this mutual trust in the German society, a “person in the middle”, “objects in the middle”, “myths” and “rituals”  were necessary. Also a scapegoat in society was quickly found; my grandparents, parents with other descendants of my ancestors were identified as collective bearers of evil. By the sacrifice and removal of the scapegoat from the society, the German people thought to remove all evil from society. 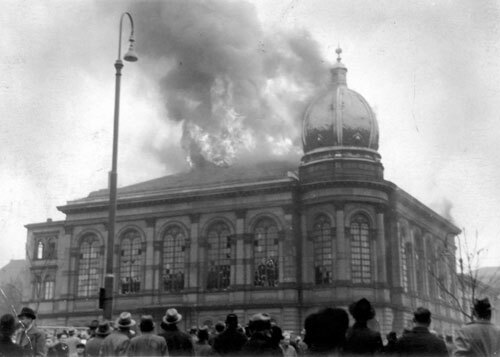 It started with destruction and small harassments and it continued with smoke offerings wherein Synagogues and books were burned in the Kristallnacht in 1938. When in March 1933 the other government in Germany had obtained all powers, my parents decided to leave: they didn’t want to be sacrificed. My grandparents remained. 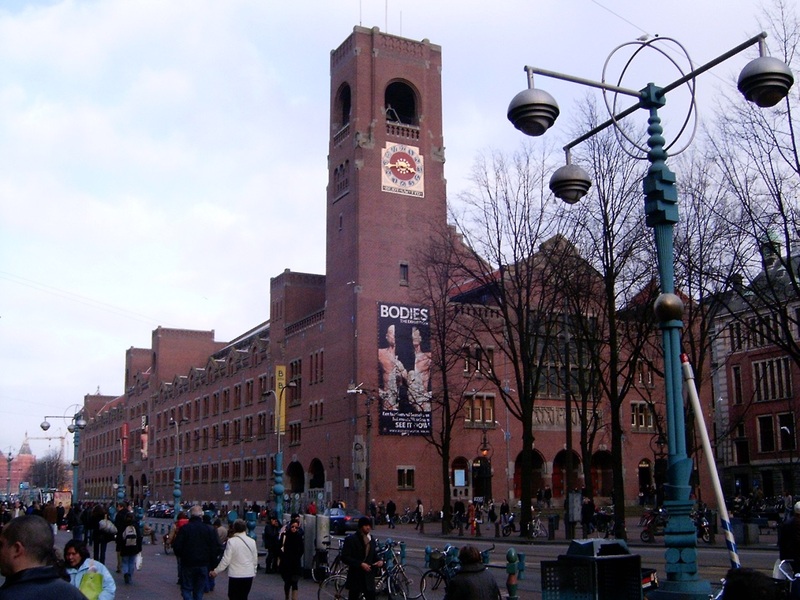 I was born in Amsterdam in early January 1934. Also Amsterdam was in a financial crisis. With the small base capital deposited by my grandparents in the 1920’s, my parents could start anew in an district similar to the Rivierenbuurt . My father went into trade. I grew up as a Dutch boy in Amsterdam. In May 1940, the other government from Germany also engulfed the Netherlands. Some acquaintances of my parents committed suicide in despair, because they did not know another way out. My parents continued their lives. In September 1940 I went to elementary school. Except the “J with yellow star” on my clothes, life continued as usual until the end of 1941. On a night before I went to a sleepover at my aunt, my parents told me that I would stay away for a long time, but that eventually everything would be fine. I stayed at my aunt for one night. Via several intermediate stops and a new first and family name I ended up on a farm in South – Limburg (The Netherlands). From that time my official name is Hermanus  Maria Jacobus  Leben; I was baptised Catholic. They called me Man – a name that against the wind carries far over the fields “, you say. “I originate from South – Limburg. I recognized your first name “Man” right away. In South Limburg there are so many names that carry far over the fields. Mat of Matthew, Wiel of Wilhelmus, Sjraar of Gerard, Sjang or Sjeng of John, Joep of Joseph, Pie of Peter, Nant of Ferdinand, Sjier, Sjoef. In all these names have faces for me”, I say. “I also carry these names and faces with me”, you say. “And your parents?”, I ask. “I always carry my parents with me. In 1942 – nearly a year later, a sister was born named Carla . That is the only thing I know about her. Still always if I see women of her age with some similarity in appearance with my family, I look if it is her. Once I read: “If there is even a hair’s breadth of difference, heaven and earth are clearly separated” . There was also written: “The Supreme way is not difficult, it simply dislikes choosing”. Later more”, you say. The next post is about your school time in South – Limburg. Translation: How can one live, when one doesn’t want to die. See former posts with the same titles. The name Hermanus consists of “Herr” and “Man”. Possible the German word “Herr” is connected to the verb root “√hṛ” meaning “to offer, sacrifice” and “take, take away” in Sanskrit. Source: electronic version of the dictionary Monier-Williams – MWDDS V1.5 Beta. See also the first Chorus in the Cantate 131 of Johann Sebastian Bach: ”Aus der Tiefe rufe ich, Herr, zu dir. Herr, höre meine Stimme, lass deine Ohren merken auf die Stimme meines Flehens!“. Translation: “From the deep, Lord , I cry to you. Lord, hear my voice, let your ears hear the voice of my doubt!”. “Man” “man” means “think/consider/observe”. Probably this name is closely linked to the verb root “√śak” meaning “be able/capable” in Sanskrit. The name Carla is composed of “car” meaning “to move, to wander” in Sanskrit and “la” meaning “undertake or give”. Bron: Wick, Gerry Shishin, The Book of Equanimity – Illuminating Classic Zen Koans. Somerville MA: Wisdom Publications, 2005 – case 17, p. 54. 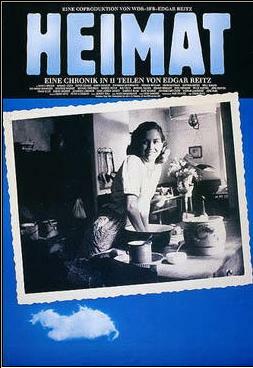 This entry was posted in Five, Introduction and tagged A war like no other, Amsterdam, ancestors, Börnestraße, Catholic, consolation, economic crisis, foreparents, Frankfurt am Main, Germany, hair's breadth of difference, heaven and earth separated, Heimat, hope, hyperinflation, Introduction, koan, Kristallnacht, love, myths, object in the middle, person in the middle, philosophy, Religion, reparations, ritual, rituals, Rivierenbuurt, sacrifice, Sanskrit, scapegoat, South – Limburg, Spanish flu, Synagogue, wrath on 23 September 2011 by Jan van Origo. All posts from February until September 2011 are available for download as Pdf-document. 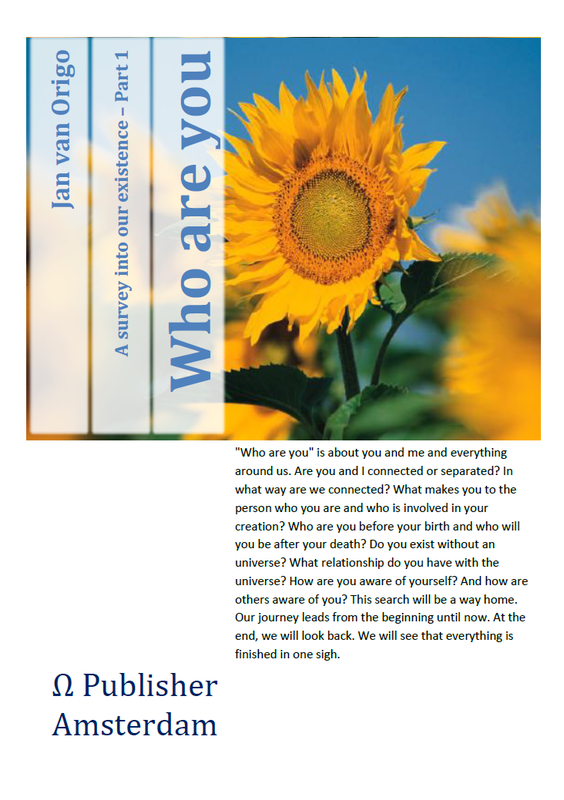 On this page you will find two Pdf-documents – Small and Big – including all posts from February until September 2011 about the search for “Who are you – Part 1” comprising the chapters 1, 2 and 3. The future two parts of “Who are you” will cover the chapters 5, 7 and 0. The first file “Small” includes the images in low resolution and comprises 7 MB. The second file “Big” includes the images in high resolution and comprises 63 MB. These files may be downloaded and stored on a computer by right-clicking with the mouse. Choose “save as” to save the file on the hard disk of your computer under documents or downloads. This document includes 247 pages: printing for own use or for education purposes is permitted. This entry was posted in General, Introduction, One, Three, Two and tagged air, ancestors, buddhism, earth, god, Indra's net, Introduction, journey, object in the middle, Odyssey, philosophy, Religion, ritual, sacrifice, Sanskrit, separation, stages, Who are you on 16 September 2011 by Jan van Origo. In the previous post we have looked at the sacrifice as “object in the middle”. 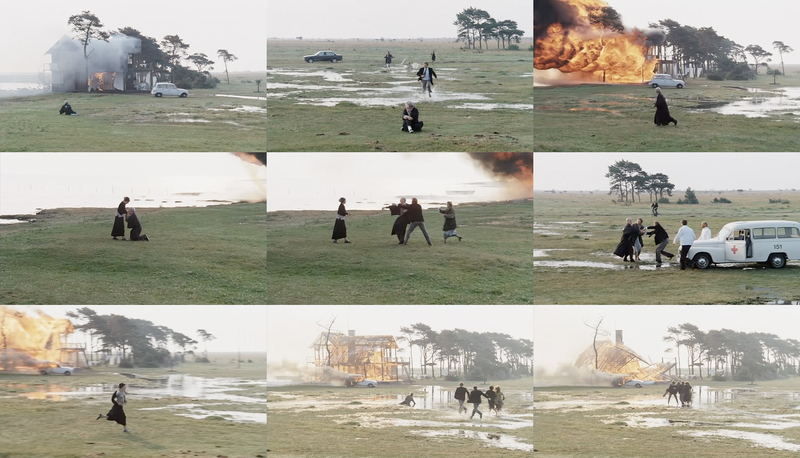 For this, you and I have looked at the movie “Offret” – or “The Sacrifice” by Andrei Tarkovsky in 1986. At the end of the film we have seen how the father has sacrificed everything he owns and binds him in this life, to God. He has made this sacrifice to save the world, in order that everything remains as it was before the threat of war and to be freed from that deadly, unbearable, animal fear. This sacrifice of the father is as well an unintentional sacrifice of his family and his relatives. The son brings three sacrifices. He loses his father because his father sticks to his word and to God’s word. He is constantly giving water to the dead tree and therefore he brings the tree – the tree of life – back to life. By the third sacrifice he remains silent throughout the film. The son asks to his father – and to God – why his father should keep his word. The son does not need any words for his sacrifice; his life, his actions and his knowledge precedes words. This question brings us to the first sentence in John’s Gospel in the New Testament . Later in our Odyssey, we will try to give answers to this unavoidable question of the son. In me I hear the Agnus Dei from Mass in B – minor by Johann Sebastian Bach. “It seems that the last weeks of our Odyssey we are travelling according parts of the liturgy of Holy Mass from the Catholic Church. A few weeks ago we started with the Kyrie: the word “church” probably originates from Kyrie. Inside the churches, we continued with the Credo in the form of light and hope. The reflection and the sermon followed within two meditation rooms. And now we arrive at the sacrifice by watching the movie “Offret” and at the Agnus Dei  as the Lamb of God, “I say. “I could never say the Credo – or I believe – with conviction. It is not possible for me to believe in the Christian theology”, you say. “You’re not alone and I feel this doubt with you. Also Thomas one of the disciples of Jesus, cannot believe in the sacrifice of the Lamb of God and the resurrection of Jesus as salvation and resurrection of all people or believers. Caravaggio’s painting shows that. 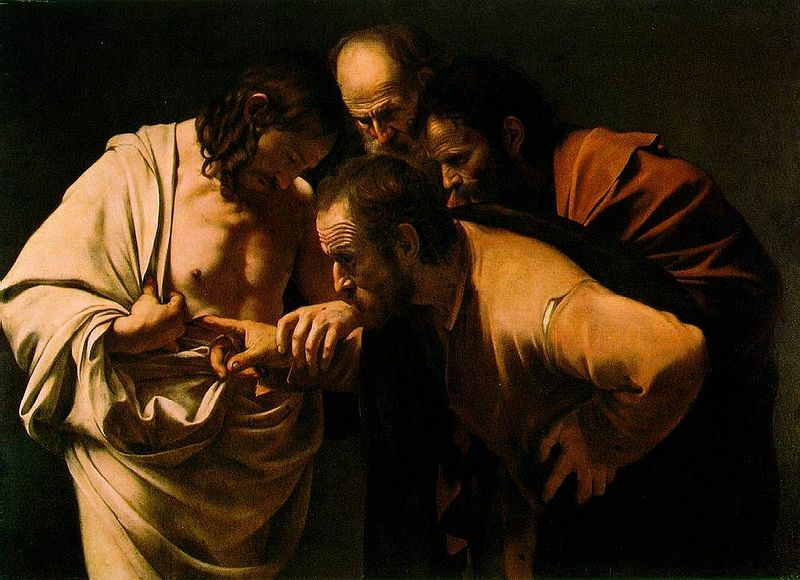 This doubt of Thomas is not taken away by feeling the wound. Probably, faith and doubt go hand in hand for many Christians”, I say. “I believe that every day the sun rises as resurrection and I believe in my next breath. But I cannot believe in the sacrifice of the Lamb of God as salvation of the universe”, you say. “People have also questioned the next rising of the sun and the next breath. Hereof many rituals are known for establishing and perpetuating this confidence. People know a lot of uncertainties about the past, the present and the future. Christian theology tries to overcome these uncertainties (“in doubt” or “doubt” in Latin) by faith, rituals – including offerings – and hope. A deeply religious Christian once said: “The last thing I want to lose is my faith.” For me, this sentence includes even a trace of doubt. A rock-solid belief never fades. By rituals people try to establish and maintain trust and hope. 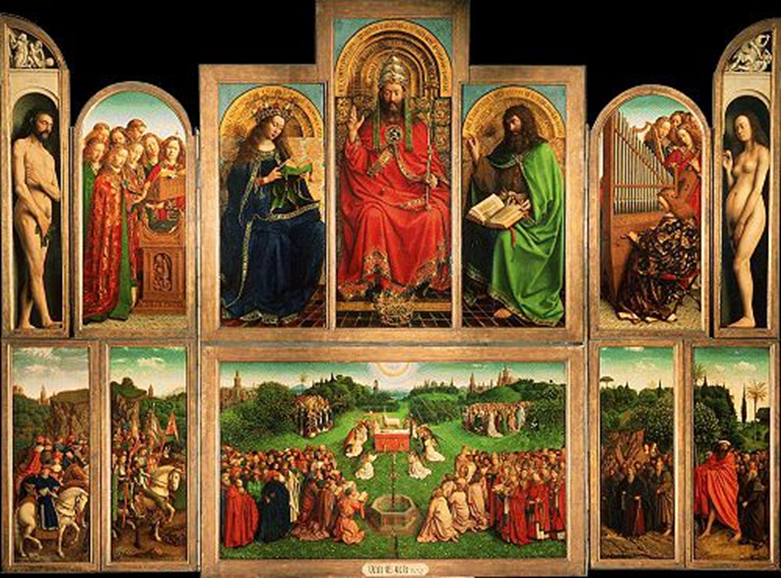 The Christian faith says: “And they that know your name, will put their trust in you.”  The painting of the Mystic Lamb by the brothers Van Eyck nicely show this: the Father, the Son as the Lamb of God and the Holy Spirit as trinity”, I say. The moon  points to the firm belief of Rӯokan”, you say. “The faith of people in the past often seems more certain, because we see their past as well established. But maybe their rock-solid faith does also know uncertainties in their lives. If we look with their eyes, do we see a different world, other uncertainties, different expectations, a different religion? I do not know”, I say. “Me neither. Shall we continue with the Dove as the Holy Spirit in the next post?”, you say. St. John 1:29 and 1:36 from the New Testament. Translation: Lamb of God, you who take away the sins of the world, have mercy upon us. Lamb of God, you who take away the sins of the world, have mercy upon us. Lamb of God, you who take away the sins of the world, grant us peace. The source of the word “Church” probably is Greek: “Kūrios” meaning “Lord, Master”. Source: Ayto, John, Word Origins, the hidden History of English Words from A to Z. London: A &C Black, 2008. Maybe the word Church originates via the German word “Kirche” from the compound of Indo-European words “kr” (karoti, kurute) meaning “make, do, perform”, and “ish” depending on the “sh” sound either “sacrifice” or “ruler”, or “ich – I ” in Sanskrit. “The Agnus Dei is part of the Mass in the Catholic church and seems to be introduced for the first time during a Mass by Pope Sergius I (687-701 AD). Agnus Dei means Lamb of God and literally refers to Christ in his role as the perfect sacrifice that reconciles the sins of mankind in the Christian theology. The prayer dates from the time of the ancient Jewish sacramental sacrifices. The Agnus Dei is sung during Mass when the priest breaks the Holy Bread and unification takes place, the priest drops a piece of the wafer in the chalice – filled with wine and water as blood of Christ. The sacrifice of a lamb and the blood of the lamb are often used metaphors in the religions of the Middle East. It refers to the ancient Jewish custom to liberate people from their sins by a sacrifice. In the Protestant churches in the Revelation the phrase “washed in the blood of the lamb” is used to designate the deliverance of the original sin supposed by the churches. On our Odyssey, we already have encountered the cattle-sacrifice in the myth and Trito cattle cycle. In art, Agnus Dei, the figure of a lamb bearing a cross, symbolizing Jesus as the Lamb of God. 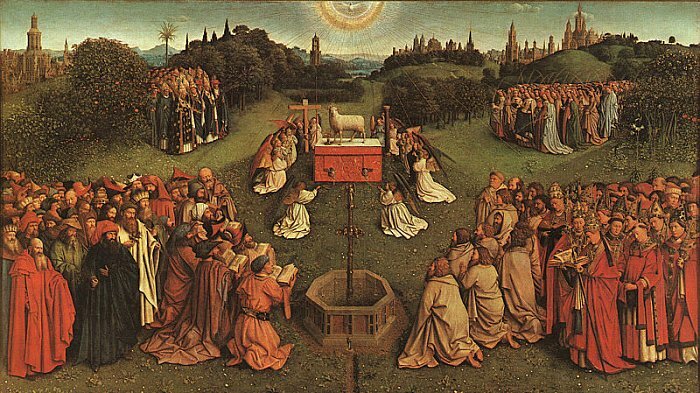 This metaphor is often used in Christian art, where the Mystic Lamb by the brothers Van Eyck in Ghent is famous. Source: Psalm 9:10: “God, the protector of the believers”. Also Job despairs when he and his wife feel the big setbacks directly in their bodies. Job asks God why he deserves these setbacks, his faith is unconditional. In a storm God replies: “Where were you when I separated the sky and the earth and created the universe!”. Hereafter Job recognizes his ignorance, he calls for teaching and confesses that he has directly God in his omnipotence. Job does penance in dust and ashes. After a cattle sacrifice, God’s wrath disappears and prosperity returns for Job. When Job would have recognized all setbacks as part of himself, may Job have answered God that he is present in the separation of air and earth? May he have the courage to say that his appearance in the separation of air and earth is adapted to the circumstances? That he always remains one during and after the separation of air and earth and during and after all the crackle that follows? Source: Stevens, John, Three Zen Masters, Ikkyū, Hakuin, Rӯokan. Tokyo: Kodansha International, 1993. Page 131. Rӯokan is a Japanese Zen Buddhist. Zen Buddhism starts in China by a merger of Taoism and Buddhism. Taoism knows Tao as a keyword meaning “road or course of life”, but this word is probably derived from the ancient Chinese word for “Moon”. Source: Porter, Bill, Road to Heaven – Encounters with Chinese Hermits. Berkeley: Counterpoint, 1993 Page: 35. This entry was posted in Introduction, Three and tagged Agnus Dei, Andrei Tarkovsky, Book, Book of Job, Brothers van Eyck, buddhism, Caravaggio, Catholic Church, Cattle cycle, Christian Theology, Church, Credo, doubt, Dove, Father, Ghent, god, gods, Holy Ghost, Holy Mass, In dubio, Introduction, Johann Sebastian Bach, John's Gospel, journey, Kyrie, life, liturgy, Mass in B - minor, Moon, Mystic Lamb, object in the middle, Odyssey, Offret, philosophy, Religion, resurrection, ritual, Road, Rӯokan, sacrifice, salvation, Sin, Son, Tao, Taoism, Thomas, tree of life, Word, Zen Buddhism on 3 June 2011 by Jan van Origo. In previous posts, you and I have visited several houses of God. With churches as “object in the middle” the faithful express a mutual trust between people and God. This confidence is continuously and periodically confirmed through rituals. Besides, the churches often create a bond between people mutual, but sometimes churches cause rejections. Churches are trying to be a timeless reference point from which the environment – air/heaven and earth separately and in combination – is experienced. The churches also provide hope for a transcendence of human life through a resurrection in an afterlife. We will visit all the churches that we encounter on our Odyssey. We also encounter “objects in the middle” which give room for meditation. These special areas create the possibility for transcending the human scale and/or experiencing a complete oneness. Specific parts of the natural landscape have been used for this purpose for centuries. During our Odyssey we have seen stone circles, caves and stones in the landscape. Probably with the occupation of homesteads people have created rooms for meditation that resemble their homesteads. Initially, the rooms for meditation are mainly located in or near their residences. Over time these rooms become major sacred places for worship and/or houses of God. Some of these places have been transferred in worldly contemplation places that we now encounter as museums and art galleries. During our Odyssey we visit almost all museums, but we cannot report on these visits. Let us visit two special rooms for meditation. 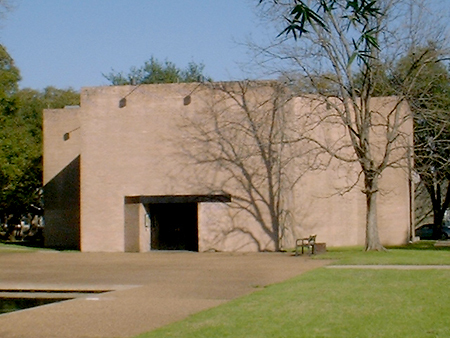 This first room – the Mark Rothko  chapel in Houston from 1967 – is building for religion and for art. 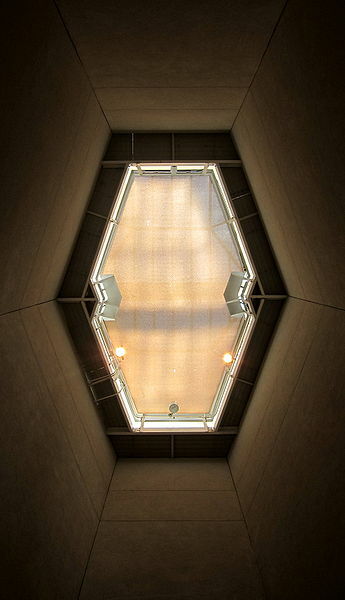 The exterior is a monolithic octagon with a small entrance. At first glance it looks like a mausoleum. ”Aus der Tiefe rufe ich, Herr, zu dir. 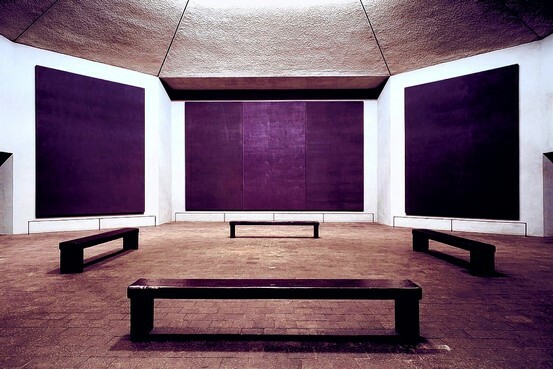 The windows to the outside consist of paintings by Mark Rothko from 1964 – 1967, shortly before his death. The paintings render all impressions of the World. It seems that he tries to imprint on the panels – in translucent blue/black ink – every word ever written and spoken.” You say. “That’s right. All glass beads of “Indra’s Net”  are included in the paint of the panels, the colours are so dense.” I say. The sun breaks through. 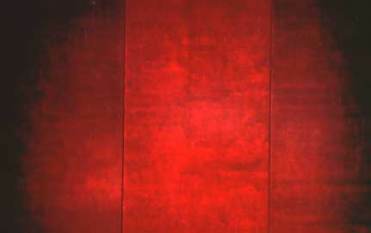 The blood of the earth lights in a purple red glow on the triptych. We sit next to a meditating – Zen? – Buddhist. When the Buddhist stands up, we go outside. “I have hesitated on joy, until the sun broke through.” You say. 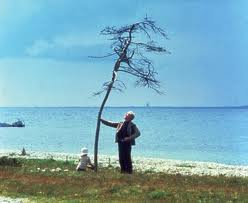 In the next post we will watch the last part of the movie “Offret” – or “The Sacrifice” by Andrei Tarkovsky from 1986. Maybe the German word “Herr” is linked to the verb root “hṛ” meaning “offer, present” and “seize, take away” in Sanskrit. Source: electronic version of the dictionary Monier-Williams – MWDDS V1.5 Beta. Both meanings of the verb root “hr” express the two roles of the warrior caste within the cattle-cycle: they rob the cattle and give a part of the cattle to the priests for offers to the Gods. A lord has also two roles: offering protection and taking a part of the harvest. Probably the role of Lord coincides with the role of God. In the experiences of many nationals the king and God are closely interwoven. Translation: “From the deep, Lord , I cry to you. Lord, hear my voice, let your ears hear the voice of my doubt!” In German the word “Flehens” means supplication. Here this word is translated with doubt, because doubt is the origin of nearly all supplication to God. See also the book Job from the Old testament. For further information on “Indra’s net”: the post “Introduction: one – Pantheïsm – Indra’s net” of 8th of April 2011. This entry was posted in Introduction, Three and tagged ancestors, Book, buddhism, Cantate 131, Cattle cycle, Chapel, China, compassion, Content, detachment, god, gods, goodwill, hermit, house of God, Houston, Indra's net, Introduction, jewel, journey, joy, language, Mark Rothko, Mausoleum, meaning, mutual trust, object in the middle, Odyssey, philosophy, Religion, ritual, triptych on 26 May 2011 by Jan van Origo. In our search for the church  as “object in the middle” we make a trip of 5 miles. 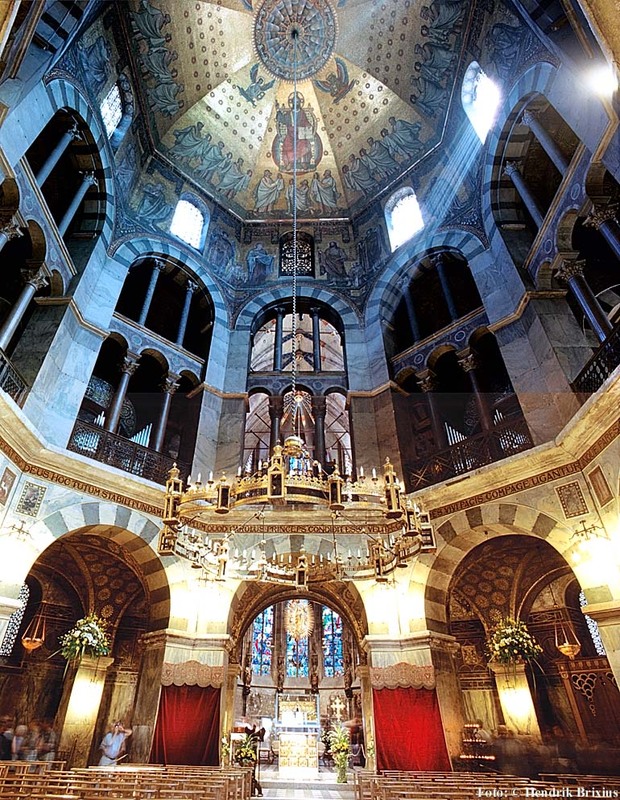 You and I begin in the – more than one thousand years old – Aachen Cathedral in Germany and continue in time through the village church in Wahlwiller in the Netherlands to the newly built church in the abbey Benedictusberg in Mamelis near Lemiers. 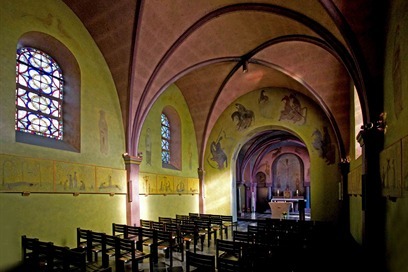 At the same time this trip leads us back in time from the contemporary city of Aachen, by the village community of 50 years past to the monastic life of many centuries ago. On this trip we travel through time as the main characters in the book “The once and future King” by Terence White. Kay and The Wart move forward in time and Merlin returns in time.” You say. “If Merlin would follow our Odyssey back in time, than he has to accomplish an impossible task in the transition from Two to One. He must group an infinite number of fragments together to restore the complete oneness. Maybe Merlin has a chance.” I say. “That’s impossible. A fractures bowl is beyond repair. I do not know what we may expect on our Odyssey. The transition to Zero is an impossible change in its own. Let’s first see the Cathedral.” You say. We look at the light in the dome. As I look at the arches, I realize that Charlemagne fought violently with the Moors. But in this house of God that emerged from the palace church of Charlemagne, the shape and the colour of the arches are very similar to the arches in the mosque in Cordoba. “Jephte makes a terrible sacrifice for his victory. His daughter keeps him to his promise to God by which she completely accepts her own fate.” You say. “In that time, women keep men in their promises . Will Jephte and his daughter rise from the death by following the promise to God by which they accept their doom? ” I ask. “I do not know. Let us hope so. I hope that all people will resurrect who accept their fate. The light in the church gives hope.” You say. The sun breaks through. The light in the dome shines around the altar and creates a golden glow. The cathedral shows itself in its full glory. “The light gives hope.” I say. We continue our trip to Wahwiller by the road past the University Hospital, the Hochschule for Technology and the border post at Vaals. After a few kilometres, we see on our right side the Abbey Benedictusberg, our third destination today. A few moments later we leave the main road and enter the village Wahlwiller. We have come to admire the paintings by Aad de Haas  in the St. Cunibertus Church. The colours inside and the Stations of the Cross in this church are exceptional. In 1947 the paintings are far too daring for the Catholic Church. After more than thirty years, the paintings of the Stations of the Cross did return in church again. We enter the church and again a golden glow. “People show the light of their surroundings. 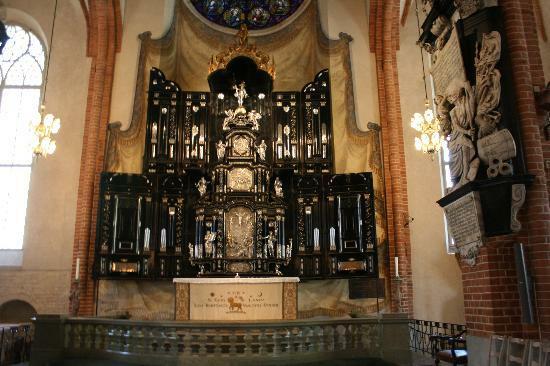 The main altar in the Storkyrkan on Gamla Stan in Stockholm consists of silver on dark ebony. This renders the bright spring light in the Nordic countries.” You say. “In South Limburg the light is much softer, therefore this golden glow. The fifteenth station representing the resurrection – in addition to the traditional 14 Stations of the Cross – is beautiful. This painting should actually be directed towards the East and be positioned behind the altar. ” I say. 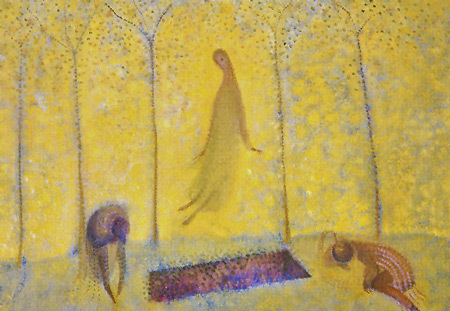 “The image of the Easter resurrection matches text: “Unless a grain of wheat falls into the ground and dies, it remains alone; but if it dies, it produces much grain.”. Considering the resurrection, I also think about a resurrection from a tabernacle. Probably a tabernacle is mainly empty to give room for the resurrection. Above the Ark the area for Yahweh is also empty.” You say. “Heaven and earth surpassing; only in the void, the sun rays may shine so beautifully in this church.” I say. We return in the direction of Lemiers. At the beginning of the driveway to the abbey Benedictusberg, you read that we may join the prayer services. First we examine the photographs of the abbey church . 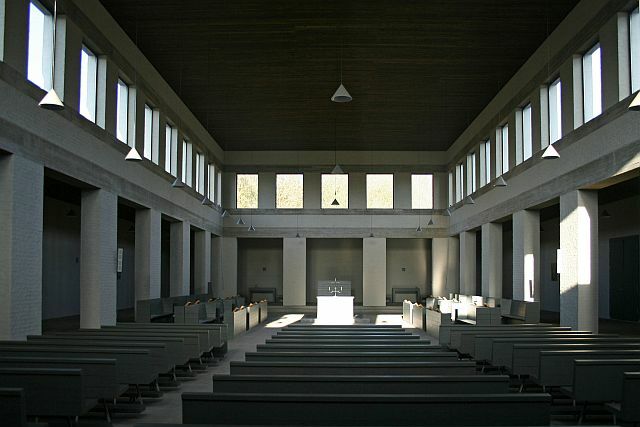 “It looks like the inside of a sanctuary. This absolute beauty of dimensions and the layout of space does not need any further images.” You say. “Very contemporary and also completely timeless. Modern and also the very first church. It seems like time has no grip on this area. What a beautiful light from above.” I say. “Let’s attend the Vespers .” You say. The following post continues on meditation centers as “object in the middle”. The source of the word “Church” probably is Greek “Kūrios” meaning “Lord, Master”. Source: Ayto, John, Word Origins, the hidden History of English Words from A to Z. London: A &C Black, 2008. Maybe the word Church originates via the German word “Kirche” from the compound of Indo-European words “kr” (karoti, kurute) meaning “make, do, perform”, and “ish” depending on the “sh”sound either “sacrifice” or “ruler”, or “ich – I ” in Sanskrit. See also: Old Testament, Judges chapter 11. Evening prayer at the end of the afternoon. This entry was posted in Introduction, Three and tagged Aachen, Aad de Haas, ark of the convenant, Book, Charlemagne, Church, Content, Cordoba, Giacomo Carissimi, god, gods, Introduction, Jephte, journey, light, Merlin, mosque, object in the middle, Odyssey, philosophy, Religion, resurrection, rise, stages, Terence White, Wahlwiller on 23 May 2011 by Jan van Origo.